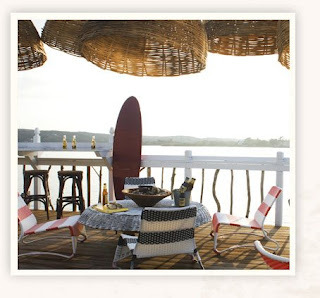 This weekend we’re headed to Montauk for a much-needed post-move getaway. A few month’s back, when we were looking into where to stay, Surf Lodge first crossed our radar. It’s from the owners of NYC’s Cain and Gold Bar (both are chichi clubs). The website photos make it look adorable and the restaurant by Sam Talbot (the hottie from Top Chef’s second season shown below) sounds promising. So we did what we always do before staying at a new hotel and looked it up on Tripadvisor.com. It wasn’t listed yet, which gave us pause. We never like to be the ones to work out a hotel’s kinks. We continued to investigate, thinking that if the hotel is new, maybe they have lower rates. They didn’t (and still don’t) accept reservations online. So we called. And the phone rang and rang and rang. Needless to say, we abandoned our idea of staying there and made reservations at the decidedly less glamorous, but well-reviewed Ocean Resort Inn. And forgot all about the Surf Lodge. That was up until this week. Rumor has it Gwyneth Paltrow and Chris Martin were spotted there recently. As was Luke Wilson, Naomi Watts and Lieve Schrieber along with U2’s Larry Mullen. In addition to being a draw for celebs, the place is creating a lot of controversy over at Gridskipper.com. Some say the hotel is seriously buggy, that it’s not laid back enough and that the service is too slow. Others say those people are just being haters. Guess we’ll have to check it out for ourselves. Good thing $12 drinks haven’t fazed us since the ‘90s.